Harmonix will feature a mode to pay homage to its original game. 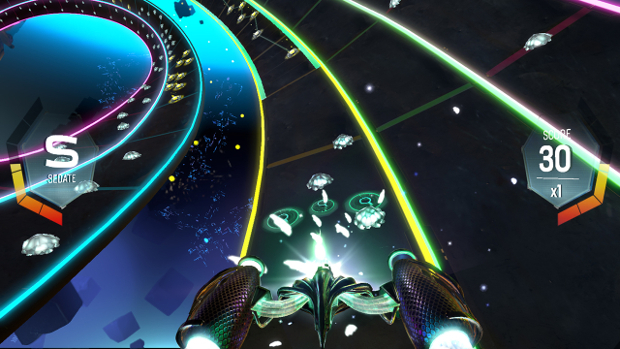 Harmonix’s reboot of Amplitude will feature an homage to FreQuency with a mode named after the game. FreQuency mode turns the flat tracks of Amplitude into tunnels that require different means to navigate. As Harmonix explains, “In the original Amplitude, we got away from the tunnel design of FreQuency and flattened out the tracks. We did this with the intention of better track recognition, allowing the player to have a better mental map of the music. We felt flattening out the tracks allowed the players to recognize that, in a certain song, the drums were always the leftmost track. “This also allowed us to show off more of the world environments. Little did we know this change would divide gamers (and the in-house team) into two camps: those who thought the tunnel was superior and those who preferred the wide highway of tracks. Amplitude will be releasing for PS4 on January 5th and will feature more than 30 songs. What are your thoughts on FreQuency mode? Let us know in the comments.